The new BD Series binoculars from Kowa offer an easy-to-use, high-quality binocular at an attractive price. The series includes three high-performance models, offering a range of options for the hunter, and all backed by Kowa’s trusted lifetime warranty. All BD Series binoculars have an innovative C3 Coating on the roof surface of the Schmidt-Pechan prism. This phase coating of dielectrics offers a reflectance of 99 percent or higher across the entire visible spectrum, preventing loss of contrast and image resolution and creating bright, sharp images. To ensure the best magnified images possible, all lenses and prisms have a multilayered coating. The models also have an inner focusing mechanism, which makes focusing a breeze, and includes a smooth-turning focus wheel. Twist-up rubber eyecups make the binoculars suitable for eyeglass wearers. The housing is waterproof and filled with dry nitrogen gas to prevent fogging. 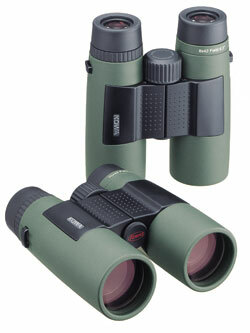 The BD Series has three models to choose from, with each model available in 8 X or 10 X magnification. The BD25 has an objective lens diameter of 25 mm and is more compact in size. The BD32 has a lens diameter of 32 mm and is slightly larger. The BD42, the full-sized model, has a lens diameter of 42 mm. With the many features and options the BD Series offers, you can be confident that these mid-priced binoculars will provide high-quality images and top-notch performance for you on many outdoor adventures for years to come.